You have taken your discovery flight and are interested in learning to fly. The first step is the Private Pilot certificate that enables you to fly with passengers but not for hire. Many people perceive learning to fly as difficult, but with one of our experienced instructors along with a structured syllabus, we can train anyone to live their dream of flying. We will meet with you and discuss the best course of action by tailoring your training to accommodate your busy schedule and ability. The FAA requires 40 hours minimum to obtain your license, however the national average is between 60 and 70 hours. We understand that everyone learns differently and with our experience, we will train according to the syllabus, but at the most efficient rate for the student to learn. The amount of time it takes to become proficient, depends on the students’ dedication, background and availability. You must be 17 years of age or older. You must be able to read, speak and understand the English language. You must pass a 60 question computerized multiple-choice knowledge test based on the ground training you received and score at least a 70%. You must log 40 hours total time, 20 of which must be flight training and 10 solo time. Once completed, you will then take a “check ride” with an FAA Designated Pilot Examiner. This includes an oral exam by the examiner and a flight test where you demonstrate your proficiency in the plane. 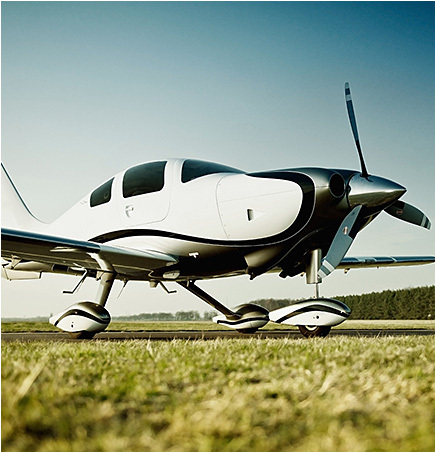 Cirrus Aircraft – Call for Pricing. Pilot Headsets (David Clark's) $306.00 - We offer loaners on a first come/first serve basis.